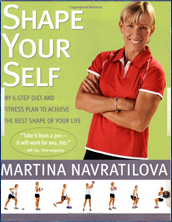 Shape Your Self was written by tennis legend Martina Navratilova so that she could share her broad knowledge and personal experience to help people lose weight and improve their fitness. It is a six-step plan that is concentrated on making lifestyle changes that will promote health and long-term sustainable results. Navratilova explains that the real secret to achieving successful weight loss is not primarily related to diet or exercise but rather with having the right mental attitude. She encourages dieters to make a long-term commitment to their health and wellbeing so that they are able to sustain a more positive lifestyle once their goal weight is achieved. There are six steps to Navratilova’s plan and each are given equal importance as playing a vital role in a balanced approach to weight loss. This step involves positive visualization, goal setting and learning to recover gracefully from your defeats. Dieters are encouraged to seek the company of supportive people and to develop strategies to cope with those that may attempt to sabotage your weight loss attempts. Dieters are encouraged to eat a wide variety of foods with an emphasis on vegetarian foods including fruit, vegetables, legumes and whole grains. Navratilova is a big advocate of juicing and raw organic foods to enhance nutritional intake and promote optimal health. The focus is on functional exercises, which help to improve posture, increase strength and build stamina. When dieters notice that they are feeling tired they are advised to commence eating small and frequent meals, always eat breakfast and increase the intake of water. Fresh fruit and vegetables (preferably raw and organic), fresh juices, beans and legumes, nuts and seeds, non-fat dairy products, soy milk. Find more healthy meal ideas here. Exercise is a major component of Shape Your Self. Navratilova recommends cardiovascular exercises such as jogging, swimming or tennis 3-4 times a week for 30-45 minutes. The book also includes four weeks of functional fitness workouts with photos of Navratilova demonstrating exercises that are designed for a range of fitness levels. Also these exercises can be used with Shape Your Self. Shape Your Self retails at $27.95. It will also be necessary to purchase some exercise equipment including dumbbells and a medicine ball in order to follow the fitness plans that are included in the book. Encourages gradual weight loss in favor of more drastic approaches. Many practical tips are included. Exercise program is interesting with a lot of variety. Includes a 28 day menu plan with recipes. Includes personal stories that many readers will relate to. Navratilova may inspire many readers due to her success both on and off the court. Does not allow coffee or alcohol. Intake of meat and dairy foods must be limited. Requires a degree of commitment to follow the exercise guidelines. Necessary to purchase some exercise equipment. Shape Your Self has created a very sensible and well-rounded program with an emphasis on permanent results. It will allow dieters to develop the skills necessary in order to maintain their health and can be followed as a lifestyle maintenance plan once the goal weight has been achieved. Shape Your Self will especially be suitable for dieters who would like to increase their physical fitness and develop positive lifestyle patterns that will support their health and wellbeing over the long term. A healthier diet would be to avoid unfermented soy products such as soy milk and low fat dairy products. Best diet for health is currently thought to be as follows: 4 to 5 small meals a day each containing some protein such as fish, chicken, eggs, whole milk natural yogurt, plus vegetables, whole grains, small amount of good oil such as olive oil. Eat fruit in moderation between meals. 1 or 2 of these meals a day could be a whey protein shake which is a very healthy protein. Take a fish oil supplement each day (krill oil may be the best). Drink plenty of water/tea between meals. Limit coffee intake. Avoid sugar as much as possible as cancer also grows best in a sugary environment. A teaspoonful of cider vinegar in a glass of water sipped before or during a meal helps digestion. Note: a meal is not a meal unless it contains some protein (at least 20g each meal). After 3 hours if you do not eat some protein, your body will start to consume your muscle tissue.